It seems these days most people are living to retire. They strategically plan for it, save money, invest and try to retire early. 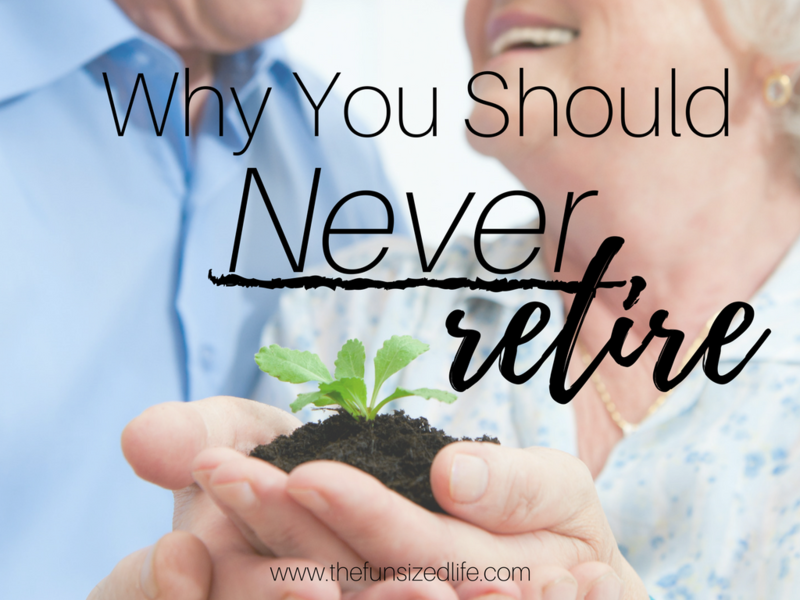 Well, as surprising as it may sound, there is a seriously important reason why you should reconsider retirement; and maybe why you should never retire at all. If you have ever struggled finding a reason for why you should wake up in the morning; I have the answer. For the last century, there has been a culture that has continuously blown the rest of us away. They have lived longer, healthier and happier lives and a major reason for this is because they never retire. The people of Okinawa, Japan don’t actually have a formal word for the word retirement. Before you decide even the idea of never retiring sounds too exhausting, here me out: Okinawan’s instead spend most of their lives focused around Ikigai; a word translated to mean, “The reason you wake up in the morning.” Rather than living their lives for a job or working just to get paid, they instead focus on their lives and their purpose as a whole. Doing this has added greatly to their health and life expectancy as well as their over-all happiness. Even the eldest Okinawans are usually up with the sun working in their gardens or tending to their homes. The funny thing is, despite their major working habits, they continue to out-live the rest of us. In Okinawa, the average life span for men is 84 and for women it’s 90. In fact, there are five times more 100 year olds in Okinawa than there are living in the rest of Japan. I can’t help but think this goes hand in hand with why my grandma was tearing up the dance floor at my wedding at the age of 80 and still, at 89 is livelier than ever. True, she has been living in America the majority of her life, but it’s very clear that her Japanese heritage is deeply instilled in her. Every day she goes out with friends, she sews, cleans, golfs, walks, and uses no excuse (not even a heart attack) to stop her from mowing her own lawn despite my mom’s best efforts to do it for her. Now of course, retirement as we know it is something that most of us will see in our lifetime, at least from our paid jobs. It’s wise to plan for it, save money and be prepared when we inevitably leave our day jobs. Like I said, the thing with Okinawan’s is that they don’t see their lives and jobs separately. It all combines into their Ikigai; the reason they wake up in the morning. Since the beginning of time, one of man’s greatest questions has been, “What is my purpose?” Well, there is actually a great model to help you get started on finding out. Find your Ikigai so that you can happily never retire by finding joy in your work every day. In circle number one, come list the things that you love. Maybe family and friends. But beyond that; art, reading, science, TV, photography, money…what are things that you really love in life. Things that maybe are different for you than they are for other people. For me, minimalism played a huge part in helping me to clear clutter from my life both physically and mentally. In doing so, I was able to get a clearer picture of just what I wanted out of my life. I was one step closer to Ikigai and I didn’t even know it. In circle number 2, think about those natural talents of yours. What are you good at? Write them all down. Keep in mind that you want to make sure what you’re good at is also something that you love doing. For example, I am great at folding pants. I worked at Old Navy during high school and had the privilege of being a denim specialist because I folded pants so gosh darn good. Now, that’s something I’m good at, but it sure doesn’t light a fire in my soul. So, I’m gonna go ahead and leave that off my list. After working your way through the first 2 circles, keep them in mind for the third circle: What you can get paid for. Are there jobs that you have had in mind? A start up business idea you can’t shake? If so, get some inspiration from these successful female entrepreneurs. Think of all the different payment possibilities out there and write them down. This one is probably my favorite circle. It’s time to look outside yourself. Let go of any ideas of making money, or what you stand to gain from a job, and just ask yourself, “What does the world need?” We stand to gain so much from helping others. Serotonin levels literally rise when a good deed is done. They rise in the people who do the good deed, the people who have the good deed done to/for them and any person who witnesses the good deed! It’s literally a win/win/win situation when we start thinking of others and putting those thoughts into actions. Doesn’t that sound so high school clique-ee? “The inner circle.” Dun…dun…DUN. But, this is where you can really start to gain some perspective. It’s were you take the ideas from your big circles and start to break them down to get closer to the reason you wake up in the morning. Look at the circles that overlap and see where you find similarities or things that can go hand in hand. Now start to combine them. I’m not a math person, but this is the kind of graph I can really get behind. What a purposeful, well thought out way for people to start getting down to their purpose in life. A purpose that you don’t ever have to retire from. When you are fulfilled and joyful, there is no need for retirement. You will want to keep going, your fire will keep burning and you will know why you wake up in the morning. Combining all these things, your passion, profession, vocation and mission ultimately combine to give you your ikigai; your reason to wake up in the morning. Your entire purpose for living. So many of us have forgotten about some of the huge benefits that come from good old fashioned hard work. People spend their whole lives waiting for the day they no longer have to work. It is my deep belief that we are capable of living our purpose and working every day to fulfill it whether that’s at a job, in the home, or simply how we interact with the world around us. (Or all of it rolled together!) Lose the idea of retirement, start living on purpose, and you just may find yourself working your way to a longer, more fulfilled life. Don’t Foreg to PIN This! This is such a great post, and the concept is so good. SO GOOD! I see people who I know who have retired and struggle with it because they don’t know what to do with their time. But then I see people who have retired from their 9-5, but as you mentioned about your grandma, are lively and out there living life. It really is inspiring! I’m so glad you like it. I really loved the concept of Ikigai but wasn’t sure quite how to share it. It’s so important to keep learning and contributing, as long as you love it!